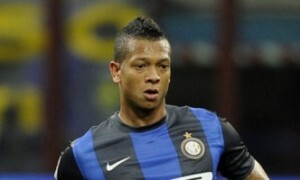 Interesting transfer news are out claiming that Tottenham are considering a move for Inter Milan midfielder Fredy Guarin. The Daily Express revealed that Andre Villas-Boas has been assessing his midfield options ahead of next season, and Guarin it seems has caught his eye. Sources in Italy suggest President Massimo Moratti would be open to a high end offer for him, so that he can press ahead and fund moves for AC Milan’s Mathieu Flamini and Juventus’ Mauricio Isla.